Going for a picnic and told you to bring a salad? What’s more suitable than potato salad? But the potato salad could be very boring ... so here is a recipe for potato salad and salmon that does not just taste good, but you will receive plenty of compliments as well. 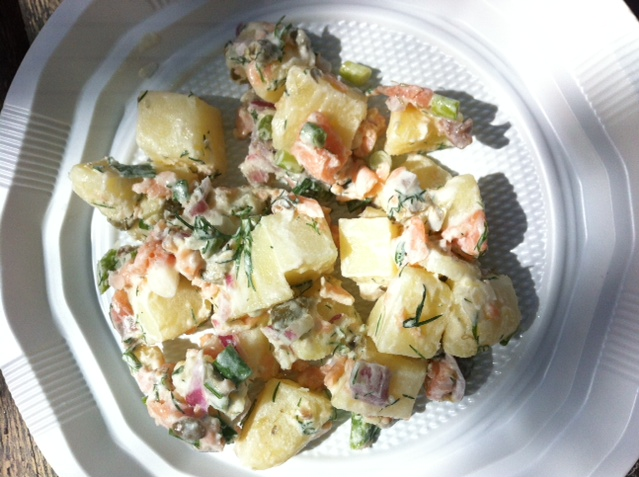 Potato and salmon salad is an excellent dish for picnics or home-cooked meals. Anything goes. Peel the cooked potatoes and cut into rough cubes. Add to the bowl along with the remaining ingredients. Ready! Wasn’t that easy? And it tastes great!